Prices of essential drugs have been increased repeatedly for last six months. It has been a major concern of Shathya Andolon (Health Movement). 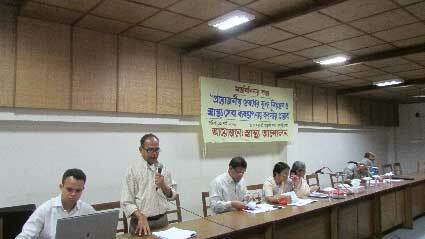 To respond to this issue Shathya Andolon organized an Opinion Sharing Meeting yesterday. Over 35 professional s from respective fields including physicians, policy makers involved in Health sector, lawyers, researchers, health activists, experts of Unany and ayurbeda and development workers joined the session. The speakers of this session presented a wealth of information including the law and legislations related to health rights, production of essential drug, consumer rights protection act, resisting monopoly and price control. We will appreciate more discussions. Lets’ do it.